This RS Components RS Pro Surface Mount Fixed Resistor is manufactured using thin film technology and is supplied with 0207 MELF case. 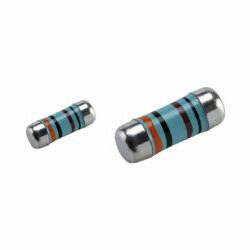 The device provides 100Ohms at ±1% 0.5W. The device is offered at an automotive standard and AEC-Q200 Qualified. The minimum Operating Temperature is -55C to a maximum operating temperature of +155C. The maximum overload voltage is 600V with a maximum operating voltage 200V. The device is minimum temperature coefficient -50ppm/C and maximum temperature coefficient +50ppm/C. The device dimensions are 2.2mm (diameter) x 5.9mm, with a length of 5.9mm.